So I'm a day late, that's how retirement goes these days. Can't complain, if it doesn't happen today I'll get to it tomorrow, maybe. Wanted you all over at Julia's Stamping Ground to see my workdesk this week. 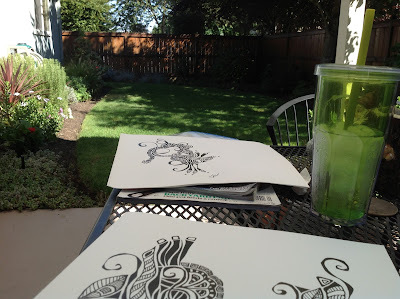 Since my doodling goes with me, I can work from anyplace. I really wanted to be outside, we've had really warm weather and I wanted to enjoy it while it last. I'm working on a piece for a gallery submission. The show is Black & White, have to have it submitted by the 15th. 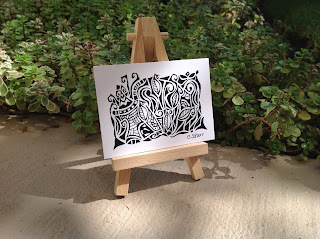 Just another little addition to my Etsy Shop I wanted to show you, I started making prints of my doodles in ACEO size. I started with 4 different prints, 2 of them are the ones shown in the Sep/Oct issue of Cloth Paper Scissors. Hope everybody is busy crafting. On Thursday check out Meri's Blog for Share the Joy Thursday. Cyndee, that wonderful! Blessings for the submission and showing. Your work is beautiful! Your doodles are beautiful, I love your piece for the gallery! It's so nice that you are able to work outside. Thanks for popping by my blog! So beautiful and unique, Cyndee. I'm glad you're really going after this! Your black and white art is awesome...I like the angular aspect of some of the shapes, which distinguishes it from most other 'zen' type doodles that are usually round shapes. Love how you've branched out into the shoes and books! Congrats on retirement and getting published!